I laughed, I cried, (but mostly laughed), and I was captivated as I read “Love & Feathers”. As an avian veterinarian and a “parront” to a flock of five amazing companion parrots, I found this book by Pearl and Shannon Cutts to be irresistibly entertaining and emotionally uplifting. 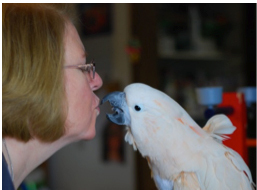 With words and photography, Shannon perfectly captures living with and loving Pearl, a companion parrot. She does not gloss over the negatives (the mess, the moodiness, the endless pooping), but Shannon clearly makes the point that this is a minor inconvenience compared to the wonder, companionship and love of living with feathers. Shannon follows each chapter with insights into her life that she has gained from living and loving Pearl that you will find meaningful for your own life. I recommend “Love & Feathers” to all of us “parronts” to the little guys, especially cockatiels and budgies (parakeets). The little guys are the number one species of parrot given to parrot welfare organizations across the country. These birds are the best companion parrots, but are too often abandoned or given away because they were purchased as “starter birds” or because they are less expensive. Cockatiels and budgies are every bit as wonderful, beautiful and intelligent as their larger cousins, but are much easier to live with! 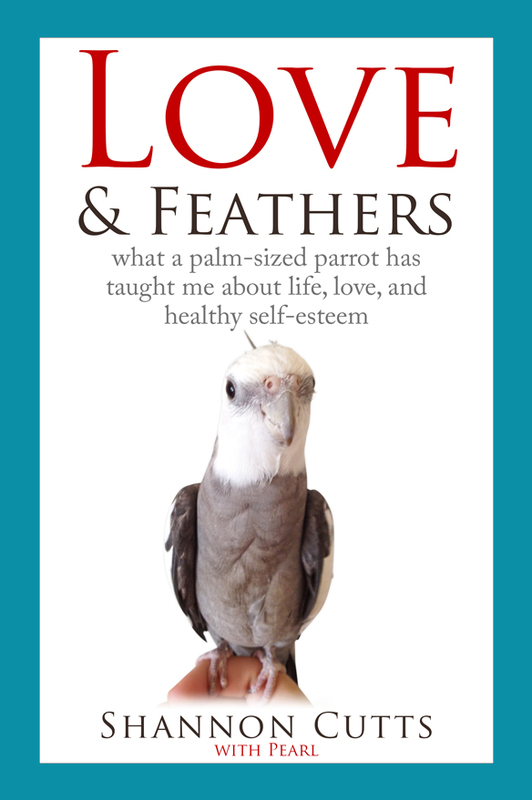 “Love & Feathers “is one of the best books I have read about the fun and reality of living with a companion parrot. If you live with and love a bundle of feathers, this is required reading. Be sure to buy an extra copy or two for your “parront” friends; they would make great presents! 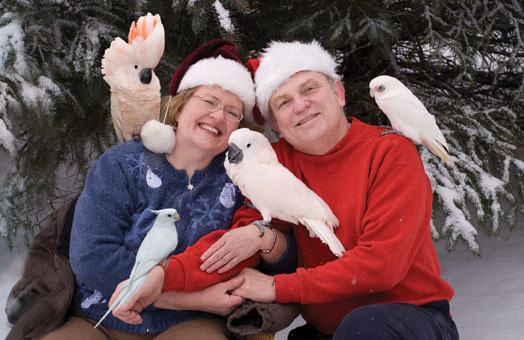 Ellen and her husband with their fabulous and feathery flock.